In my childhood we always had domestic cats in our family. Later on in my youth the first Siamese joined us and with her the passion for breeding started. In 2011 I decided to change to an exceptionally beautiful and special breed that fascinated me for a long time. The Bengal. And that's when our Dao moved in. At the same time another amazing breed wouldn't leave my mind. What I find particularly impressing in Toygers, beside their beauty that is nothing behind the Bengal, is their especially well-balanced character. In December 2012 I could finally fulfill this dream with the arrival of Velia and Hope's Child. No words or pictures can adequately describe these fantastic two breeds, the best would be to just expirience them live. Nowadays I´m breeding these wonderful animals together with my husband. 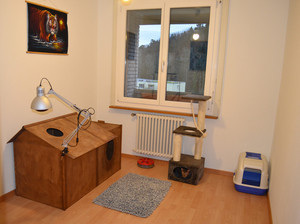 We have been breeding cats in Switzerland, near Zurich. Now we are based on the island of Taiwan. Our breeding goal is to raise healthy, friendly and beautyfully glittered kittens. In the development of the Toygerbreed we want to focus oncolor and pattern, and the shape of the head. A particular aspect is the whited tummy. We were one of the first two Toyger Catteries in Switzerland and are the very first Toyger cattery in Taiwan!